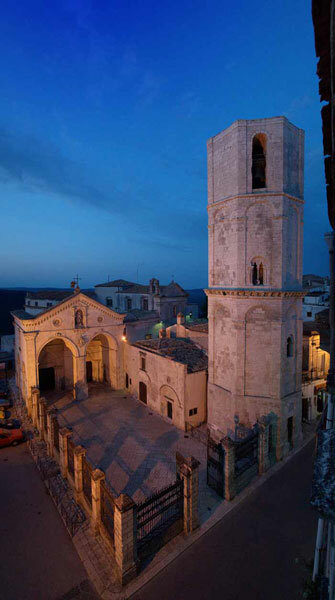 Monte Sant'Angelo, the highest town in the Gargano (843 m.), is situated in an enviable panoramic position on a southern spur of the promontory with to the west a view over Tavoliere, and to the south over the gulf of Manfredonia. 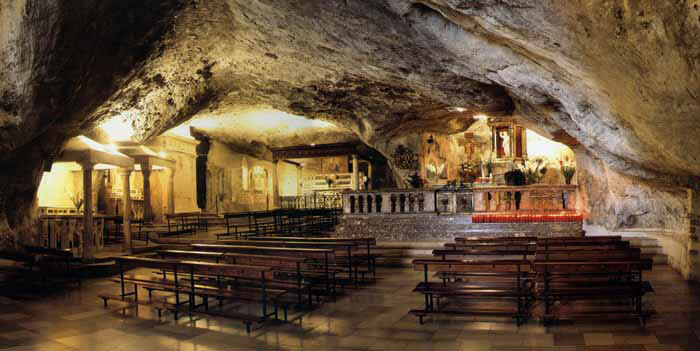 The spur it stretches along is a limestone feature, and has numerous caves and grottoes, the best known of which is the one containing the altar of S. Michele Arcangelo. The Gargano promontory is remarkable lucky to have the sanctuary of San Michele Arcangelo on its territory. 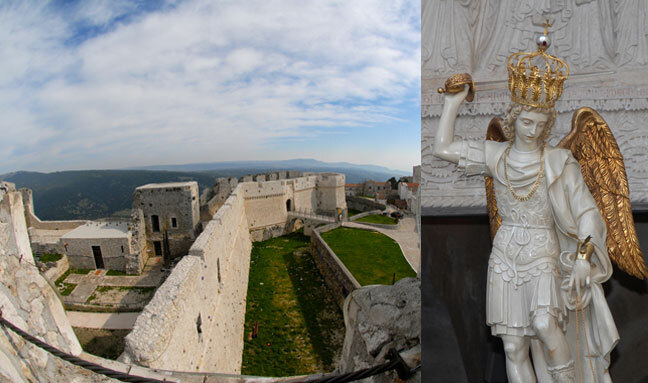 This is, without a doubt, the most famous place of worship dedicated to the archangel Michael of the Latin west. It is constantly the destination of illustrious pilgrims and people from every layer of society, with people even coming here from distant places. 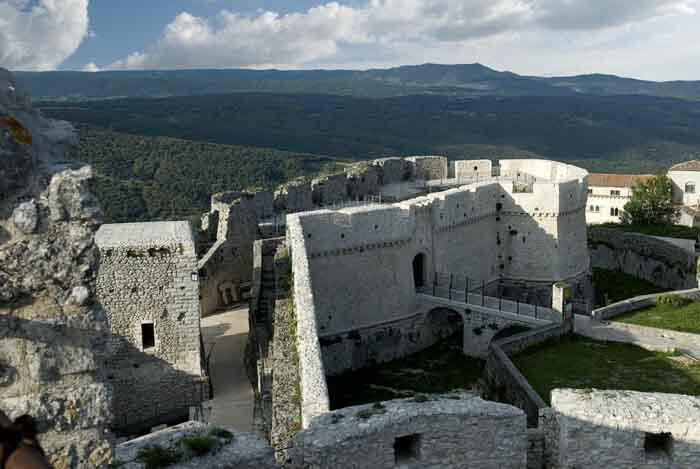 For Monte Sant'Angelo the Norman-Swabian period, which constituted one of the highest moments of its economic, artistic, and religious development, coincided with the height of the celebrity known by the sanctuary. Indeed, the chronicles of the time report it as being amongst the four most visited destinations of Christian pilgrimage, for pilgrims following a journey of spiritual redemption, known as Homo, Angelus, Deus, which required the visitation of the tombs of the apostles Peter and Paul in Rome, and of St. James of Compostella in Spain (Homo), the Angel of the Holy Cave of Monte Sant'Angelo (Angelus), and then certain places in the Holy Land (Deus). Places to see: Basilica of San Michele Arcangelo; the octagonal bell tower; the complex of monuments of S. Pietro, the baptistry of San Giovanni (known as the Tomb of Rothari) and of S. Maria Maggiore; the Norman, Swabian, Aragonese, Angevin castle; the Pulsano abbey. Churches: SS. Trinità and ex-convent of the Clarissas; of San Francesco d'Assisi and its Franciscan convent; of San Benedetto and ex-convent of the Celestines; of S. Antonio Abate; of S. Maria del Carmine and ex-convent of the Carmelites; of San Giuseppe; of S.Nicolò and ex-convent of the Capuchins; of San Salvatore; of the Incoronata; of the Madonna degli Angeli; and the church of Sant'Apolinare; Museums: Museo di Arti e Tradizioni popolari del Gargano (Museum of traditional art and folklore); Museo Lapidario della Basilica di San Michele Arcangelo (museum of stone tomb sculpture); Museo Devozionale della Basilica di San Michele Arcangelo (religious museum); Museo Naturalistico Foresta Umbra (museum of nature of the Umbra forest).